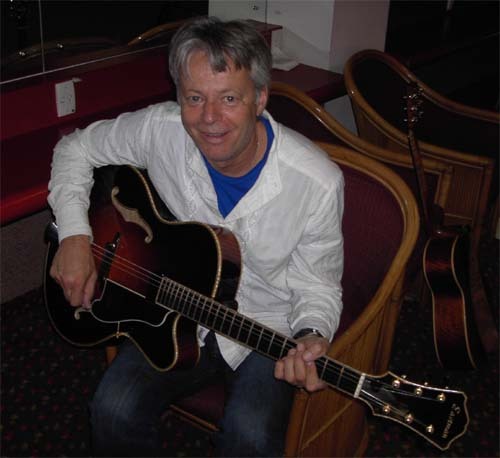 Tommy Emmanuel AM (born 31 May 1955) is an Australian guitarist, songwriter and occasional singer, best known for his complex Fingerstyle technique, energetic performances and the use of percussive effects on the guitar. Although originally a session player in many bands, Tommy has carved out his own style as a solo artist in recent years, releasing award winning albums and singles. In the May 2008 and 2010 issues of Guitar Player Magazine, he was named "Best Acoustic Guitarist" in their readers' poll. In June 2010 he was appointed a Member of the Order of Australia (AM). Tommy was born in Muswellbrook, NSW, Australia in 1955, one of six children. He received his first guitar in 1959 at age four and was taught by his mother to accompany her playing Lap Steel Guitar. At the age of seven in 1961 he heard Chet Atkins playing on the radio. He vividly remembers this moment and says it greatly inspired him. By the age of six, in 1961, he was a working professional musician. Recognizing the musical talents of Emmanuel and his older brother, Phil, their father created a family band, sold the home, and took his family on the road. With the family living in two station wagons, much of Emmanuel's childhood was spent touring Australia, playing rhythm guitar, and rarely going to school. Eventually the New South Wales Department of Education insisted that the Emmanuel children had to go to school regularly. After his father died in 1966, the Emmanuels settled in Parkes. Tommy eventually moved to Sydney where he was noticed nationally when he won a string of talent contests in his teen years. By the late 1970s, he was playing drums with his brother Phil in the group Goldrush as well doing session work on numerous albums and jingles. He gained further prominence in the late 1970s as the lead guitarist in The Southern Star Band, the backing group for vocalist Doug Parkinson. During the early 1980s, he joined the reformed lineup of leading 1970s rock group Dragon, touring widely with them, including a 1987 tour with Tina Turner. He left the group to embark on a solo career. In 1994 Australian music veteran John Farnham invited him to play guitar next to Stuart Fraser from Noiseworks for the Concert for Rwanda. Tommy became a member of Farnham's band. He had previously been a member of Farnham's band during the early 1980s and featured on the album Uncovered.Tommy and his brother Phil performed live in Sydney at the closing ceremony of the Summer Olympics in 2000. The event was televised worldwide with an estimated 2.85 billion viewers. In the last decade he has teamed up with our members Martin Taylor and Frank Vignola regularly. Tommy has visited Perth many times and has been a Patron for some time now. He alway makes time to meet with JGSWA members when he is here.